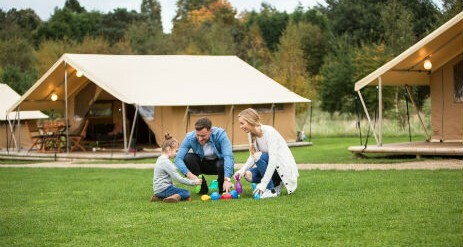 The best in glamping, our tents at Kelvedon Hatch Ready Camp in Essex offer a wonderful balance between contemporary and outdoor living. With stylish features, proper beds, sofa and dining facilities, and an outdoor deck area you will find is all that you need. 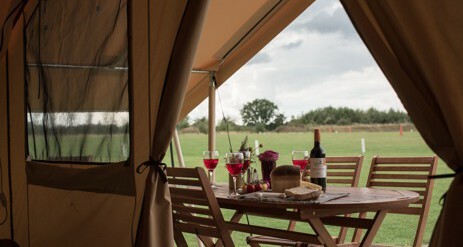 There is plenty of storage in the your living area and bedroom giving you space to enjoy your stay as well as a fully stocked crockery cupboard to create some lovely meals in your safari tent. The pretty decked terrace is perfectly lit for relaxing at night too. Somewhere between city, country and coast is this lovely rustic retreat. 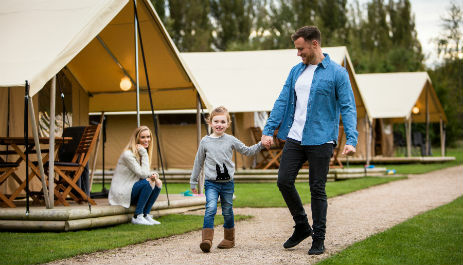 Our Kelvedon Hatch glamping campsite is the perfect place to get back to nature whilst unearthing local treasures, spending a day by the sea or heading into London for a tour of bright lights. 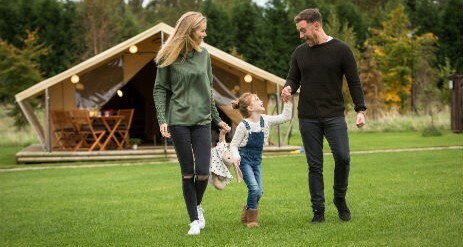 With Ready Camp, there’s no need to fill the car with camping paraphernalia and ‘just in cases’. 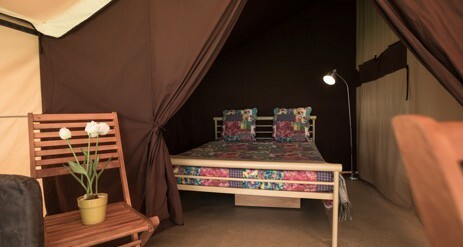 We provide a ready-prepped safari-style tent that’s packed to the rafters with creature comforts. We’re talking real beds and bedrooms, a dining area, mini kitchen, a comfy sofa… even a corkscrew! Kelvedon Hatch campsite includes toilets, showers, a parent and child room and children’s play area, along with an on-site holiday manager. Nearby favourites include the pretty village of Kelvedon Hatch where there is a secret Cold War bunker and a Regional Government HQ. It’s now a museum so you can take the tour and learn about its little known past. The leafy town of Brentwood, otherwise known for its role in The Only Way is Essex is only 4 miles away. Brentwood offers shops, bars, cafes and restaurants as well as the ruins of a 12th century chapel in the centre of the town. Other visits should include Mountnessing Windmill which is a restored and working mill and Old MacDonald’s Farm a children’s petting farm with indoor play centre.